Three of our famous originals! We've piled up a trio of our best-selling gift boxes and tied them all together with a red satin ribbon. 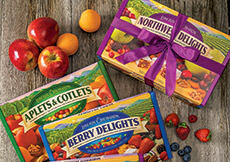 Includes Aplets & Cotlets, Fruit Delights, and Berry Delights. Choose from the original 24-oz. Trio (three 8-oz. boxes) or our NEW 36-oz. Trio (three 12-oz. boxes). Kosher. INGREDIENTS: BERRY DELIGHTS: sugar, corn syrup, fruit [fruit juice from concentrate (blueberry, strawberry, boysenberry, raspberry, cranberry, apple), cranberries, blueberries, blackberries, raspberries], nutmeats (walnuts, pecans), modified corn starch, pectin (pectin, disodium diphosphate, sodium polyphosphate, dextrose, dicalcium phosphate), natural flavors, sodium citrate, citric acid, malic acid. Bought these before and they have been wonderful this year can't say the same. Cashmere, Washington is a lovely town surrounded by orchards. I was there one day and found this busy factory and the gift store, lucky me. After much sampling, I discovered this perfect three pack of delights, which is like the best deal anywhere and completely delicious. 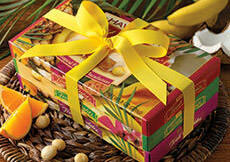 I love introducing people to these lovely sweets, and this gift pack is the perfect way to do so. They don't last long once the box is open! I bought this trio as a Father's day gift for Dad. He shared some with me. We loved the variety and taste. I liked them so much I bought a trio package for my family. Everyone loved them. Will buy them again. These are a great assortment for friends and family! 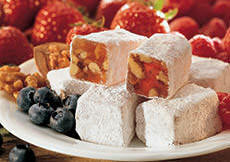 We celebrate Yuletide, which stresses the giving of fruit and nuts. This provides that in a very festive treat that my whole family loves and appreciates!!! While visiting family in Washington this summer we discovered these yummy candies. We bought a box for our return trip to Iowa. Only wish we bought more! We finished the whole box! These are little delights! We plan on buying more to give away for the holidays. Someone sent us this trio box. I'm sorry, but these are the most disgusting things I have ever tried to eat. The texture was unappetizing, you could taste sulfites in the fruit, overly sweet. Tried one, thought, maybe the wrong flavor, I'll go for raspberry. Had to spit out what I bit off. My horses wouldn't even taste them... In a word - yuk. and I'm sorry the gift giver spent the money on these. Hard to resist - so I don't even try to! 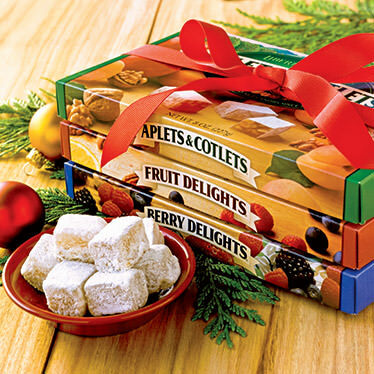 I have tried all of the flavors in this trio (Aplets&Cotlets, Fruit Delight, Berry Delight) and have found each to be fabulous in flavor and texture. The flavors are EXACTLY like perfectly ripened fruit. Plus these snacks are quite heathful in comparison to most holiday treats. I will be ordering more for family and friends! I OPERATE A HOTEL. ONE OF MY CUSTOMERS A VERY SWEET ELDERLY COUPLE GOT THIS 3 PACKS OF CANDIES FOR US AS A GIFT. IT WAS VERY NICE OF THEM, THE CANDY IS LIKE NONE I HAVE EVER HAD BEFORE. I LIKED IT SO MUCH THAT ALL MY FRIENDS AND FAMILY ARE GETTING THIS FOR CHRISTMAS. 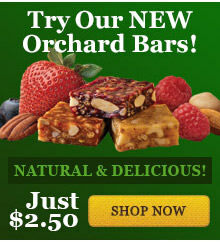 My son and I love the Berry Delights in the blue box in the Orchard Trio gift pack. It's our total favorite and wish you sold them separate from the gift pack because we would buy them in a mass of quantity just for that box.